The exotic country of Paraguay seems far removed from William the Conqueror’s New Forest – a wildlife haven nestled between Bournemouth and Southampton. Yet two teams from the Natural History Museum are focussing on these remarkable landscapes to map the hugely varied species that can be found there. Supported by the New Forest National Park Authority and funded by public donations to the Museum, the first team has already started collating a New Forest inventory of the area’s wildlife and environment. This will provide a snapshot in time of the New Forest against which changes over the next 10 years can be mapped. Museum researcher Dr Dan Carpenter collect samples in Whitley Wood, Lyndhurst. The New Forest is one of the most important areas for wildlife in the UK as it is home to a wide range of species and habitats. This landscape’s unique qualities are largely due to grazing by New Forest ponies who roam the ancient woodlands and heathlands as part of a traditional commoning system. Yet there are still huge gaps in our knowledge about the species that can be found here and how widespread they are. New Forest National Park Ecologist Ian Barker said: ‘The New Forest National Park is the most densely populated National Park in the UK and has over 13 million visitors each year. ‘Despite these pressures, thanks to good management by a wide range of organisations, the New Forest continues to be a magnificent landscape with an abundance of really special wildlife. ‘Over half the national park is designated as being internationally or nationally important for nature conservation – a higher density than any other national park in England. ‘The team is studying some of the less popular aspects of the Forest ecology – insects, lichen and soils – which are the building blocks of biodiversity but are often overlooked because people are generally more interested in the bigger species such as birds. ‘It is an exciting opportunity to obtain baseline data in a scientific way and the fact that it will be repeated and the information will be captured over five and 10 years is extremely useful. 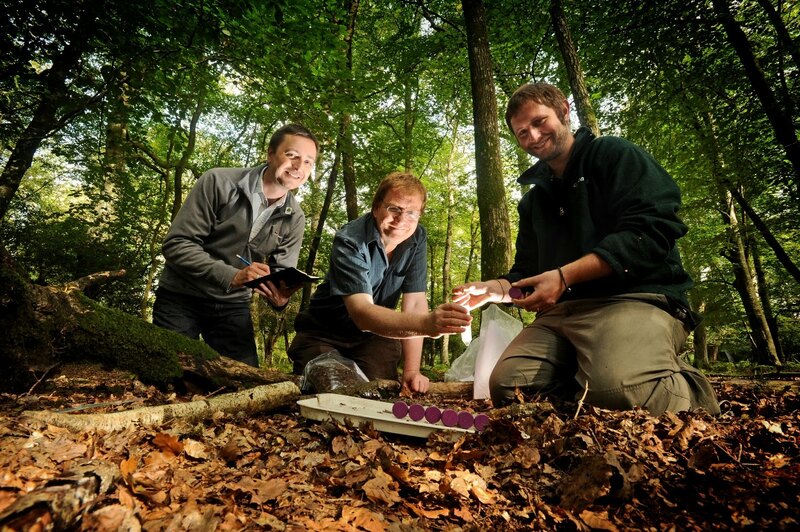 Dr Dan Carpenter, of the Museum’s Soil Biodiversity Group, said 40 plots within six habitats spread across the New Forest are being used to sample lichens, algae, insects and soil in order to document patterns of biodiversity across the forest. Meanwhile another group of Museum scientists is preparing to embark on a fieldtrip to Paraguay in November to conduct a biodiversity survey, also funded by public donations. The area is the largest dry forest in South America and the continent’s most extensive forested region after Amazonia. Very little is known of its flora and fauna. They will be working in collaboration with Paraguayan counterparts and sharing skills and expertise both in the field and in the local Museum of Natural History.